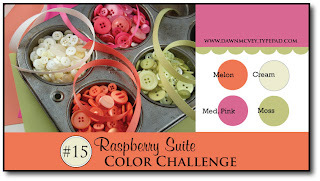 Here is my entry into Dawn McVey's wonderful color challenge. I used SU colors as I don't have PI's colors. You will see cameo coral, mellow moss, vanilla and pink passion. I used brown ink for the saying and cameo coral for the dots on the vanilla with embossing ink on the pink paper. I love using embossing ink to give just a touch of extra color without changing my original color. The ribbon is SU's from the sale-a-bration catalog. I love this ribbon and have LOTS of it! My stamp is is Dawn's own, Scattered Showers. I also used a punch from SU to punch out "So Happy for you". Sorry about my poor quality photos. I wanted to get this post up so I took the pictures in my classroom. Bridget on her Baptismal Day! Here are some photos from Bridget's big day! This is my favorite one of all. This smile is enough to melt your heart! This is a great group shot with my sisters. My sister Annmarie, the gp, is the oldest, then Karen (Bridget's mom) and then me. This is my favorite pic of my wonderful husband. I just loved the backdrop that was on the alter so we took advantage of it and shot our pictures from here. This is my honey and our niece Fiona, she is 7 months old and the best baby ever! This one is my mom and Michael and Fiona. It was a wonderful and beautiful day. Can't forget about the godparents... here is my sister Annmarie and her husband Mike. Mike loves bunnies and found Bridget's bunny ears. I couldn't help but take the picture. Nothing like a little bit of fun to put the icing on the day! I hope you had a great Tuesday and enjoyed the pics. School has been crazy so I haven't had a chance to create anything new. Here is one of the cards that I created this summer. I hope you like it. This is a one layer card (except for the butterflies). I love the simplicity of it. My stamps are Unity, paper and ink SU and butterflies were punched with Marth Stewart's punch from designer paper. Here is the card I made for my niece. The butterfly is from Making Memories and lights up when you hit the button on the bottom. The inside says It's your day (a rub on from SEI) and the fairy and celebrate from a My Favorite things set. She loved the butterfly especially since it came off the card for her to keep. The swirl on the bottom was from a Unity set. I put glue on it and then covered it with glitter. I like how the card ended up. The baptism was great even though the priest was 45 minutes late. He had 2 funerals before that so he was late to the baptism. We headed back to my sisters for a beautiful meal. We had a great time with my family and was happy we were able to make it.